USB Network Cable - Custom Sensors, Inc. 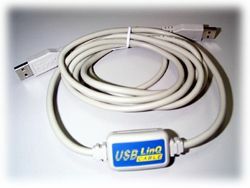 The Model ULK-003 USB Network Cable provides a quick and easy solution to connect a PC or Laptop to an existing network. As with all USB devices, connections are hot-swapable, so devices can be connected and removed from the network without power-down. The ULK-003 USB Linq/NET Cable is suitable for small offices, home offices, mobile users, and network gamers. A PC or Laptop is connected to an existing network by connecting it to a computer already on the network, using the USB ports of both computers.